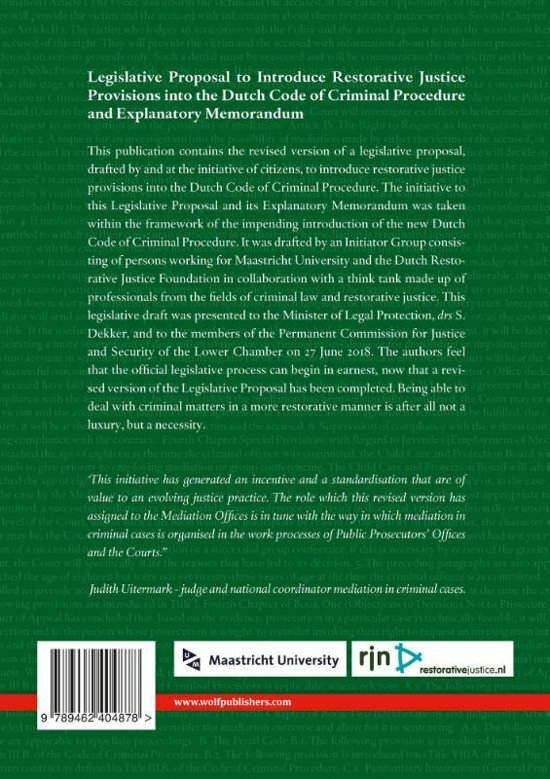 This publication contains the revised version of a legislative proposal, drafted by and at the initiative of citizens, to introduce restorative justice provisions into the Dutch Code of Criminal Procedure. 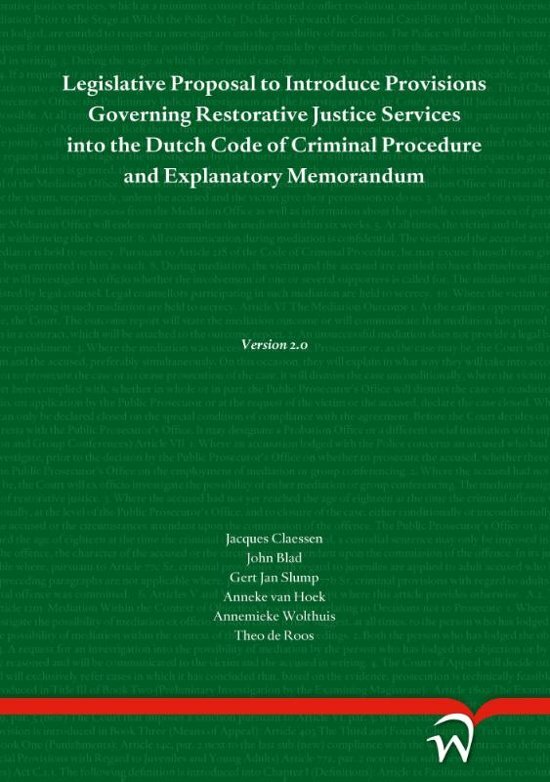 The initiative to this Legislative Proposal and its Explanatory Memorandum was taken within the framework of the impending introduction of the new Dutch Code of Criminal Procedure. It was drafted by an Initiator Group consisting of persons working for Maastricht University and the Dutch Restorative Justice Foundation in collaboration with a think tank made up of professionals from the fields of criminal law and restorative justice. This legislative draft was presented to the Minister of Legal Protection, drs S. Dekker, and to the members of the Permanent Commission for Justice and Security of the Lower Chamber on 27 June 2018. The authors feel that the official legislative process can begin in earnest, now that a revised version of the Legislative Proposal has been completed. Being able to deal with criminal matters in a more restorative manner is after all not a luxury, but a necessity. "This initiative has generated an incentive and a standardisation that are of value to an evolving justice practice. The role which this revised version has assigned to the Mediation Offices is in tune with the way in which mediation in criminal cases is organised in the work processes of Public Prosecutors' Offices and the Courts." mr Judith Uitermark - judge and national coordinator mediation in criminal cases.